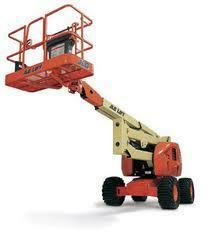 Our company holds immense experience in this domain and is involved in offering wide assortment of Diesel Boom Lift. Today, more people are demanding environmentally friendly equipment. And more municipalities are requiring “green building for new construction and renovations. These machines are specifically designed so you have fewer scheduled services, a quieter work area, less dependency on hydraulic oils and zero emissions. Ideal for outdoor construction and industrial applications Genie engine-powered articulating Z™ booms provide lifting versatility with a combination of up, out and over positioning capabilities and outreach that’s second to none. They also offer high ground clearance, two- or four-wheel drive options and rough terrain features for easy travel over irregular ground. 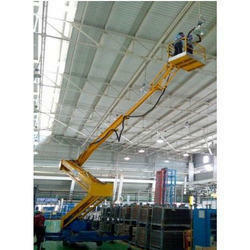 Articulated Boom Lifts in Chennai, Tamil Nadu, India - Manufacturer .sha Hydraulics Private Limited.